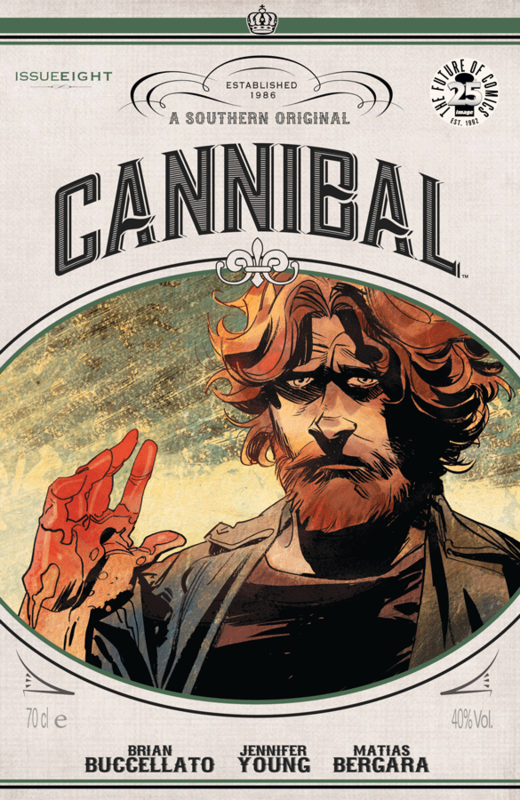 Cannibal #8 Review – AiPT! The Hansens have had a rough go of things, but are things looking up? Nah man, not in this book. Following last issue’s stunning conclusion, things seem to be settling down for the Hansen clan. With Danny’s suicide, the local lynch mob has lost interest in Grady, Cash and the rest of the family, leaving them to deal with the police. Since the Sheriff himself is hiding a cannibal in his own family, he knows to play things coy in regard to his suspicions about the recently returned Jolene, lest his son be exposed in the process too. This actually leads to a pretty cool cat and mouse sequence between the Sheriff and Roy later in the book, that almost assuredly confirms both men’s suspicions about the other’s extended kin. Speaking of Jolene, her and Cash’s reunion hits a rough patch as Cash seems a little too eager to help feed his lady love’s more malevolent proclivities. When their make up efforts go awry, we get a time jump to reveal that another member of our central cast may have succumbed to the dreaded cannibal disease. The future looks a little dark for the Hansen family. After several months of build, this week’s issue of Cannibal moves at a pretty steady clip toward a conclusion that…sort of underwhelms, actually. At the end of the book, we jump several months into the future to set up new conflicts among our central cast, and that quick pace I mentioned leaves a lot of the emotional beats that get us there feeling underdeveloped. Take, for example, Grady and Lou explaining to Danny’s son what happened to his mother and him. Art-wise, we get what looks like a great heart to heart moment between Lou and the boy, but we see none of the actual aftermath. Little man’s had it rough. Then there’s the situation between Jolene and Cash, which really sets the conflicts of the book moving forward in motion, and yet, we get literally no development of its impact on the Hansen clan and just jump months ahead. This could almost work in the setting of a trade, but given that this week’s issue really wraps up the storylines of the past several months, I’m not sure that it would work in that scenario either. This is the best scene in the book, even with the Sheriff dressed like a goon. As usual, I really enjoyed the artwork of Matias Bergara. His character models and action are one thing, but the real star of the show is his shot framing and storyboarding, which continues to be superlative. There’s a real sense of motion in each sequence, meaning the book feels so dynamic that it’s almost like watching a Michael Bay movie – one with fewer explosions, fully developed female characters and no cringeworthy racial stereotypes. Bergara is also fairly strong at capturing a character’s emotions on their face. From the subtle shades of gruff that come across Roy’s visage, to the tears streaming down Jolene’s face after Cash attacks a transient, the visual cues for these characters help translate the impact of certain elements of the experience that the scripting does not. A bit of a deflating end to the second arc, this issue sort of meanders through the aftermath of the previous book and sets up the next. Thankfully, the artwork of Matias Bergara helps the issue rise above the story's shortcomings. Bergara's artwork remains a high point. That dude's storyboards are fantastic. The scene between Roy and the Sheriff is great. A lot of the emotional moments don't have time to breathe, leaving the resolution feeling a little underwhelming.